Gardens need storage, let’s face it. You need somewhere to put your garden stuff, so why not make it playful or pretty as well as practical? You’ll be looking at it all year round. Let it be good looking – the subject of today’s Idea File. Proving that Great Minds Shed Alike, we were sifting through shed pix when we heard that the Winter 2013 issue of IntoGardens also had a feature on sheds; the finest sheds in the world – in the world! Were we daunted? Well, yes. But then we bit the bullet and subscribed to this new publication. IntoGardens is pretty cool – part-app, part-magazine – using all the iPad goodies: sound, film, touch-screen nav, big pictures. Their sheds article is fabulous, and we have only one slight overlap. Phew! Shed some light: you don’t have to hide your love away. 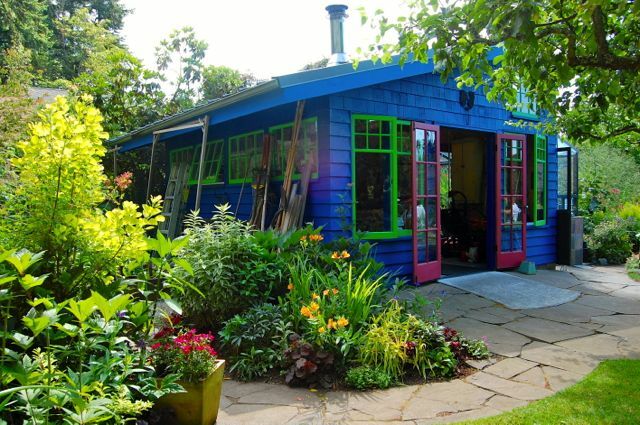 The brightly painted shed in the Birrell garden in Seattle includes lots (lots!) of windows. Yours needn’t be big enough to hold a workshop, like this one. Dave from Growing the Home Garden created a small shed using recycled windows – designing it from available materials. Great idea. This airy take on a stacked log cabin was seen at Urban Roots Community Garden Centre in Buffalo, NY. It wouldn’t keep out the squirrels or snow, but might be a quick build for temporary storage – although that green roof would need support. 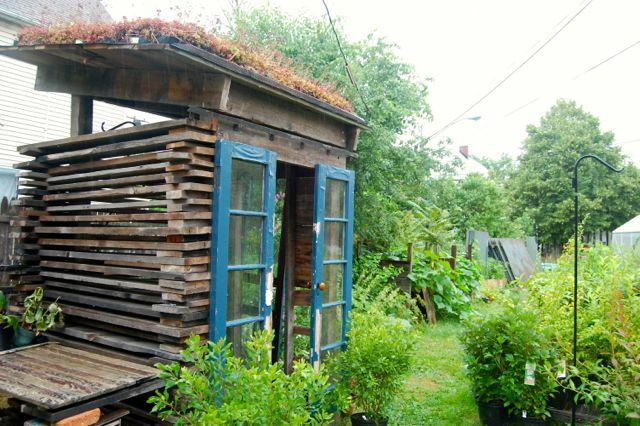 A shed is a perfect size to try a green roof on. Looking to put one on our cedar shed (and, perhaps, our front porch), I bought the book Small Green Roofs: Low-tech options for greener living, which contains ideas, recipes and tips. Lorene Forkner’s summer house is cute on wheels! 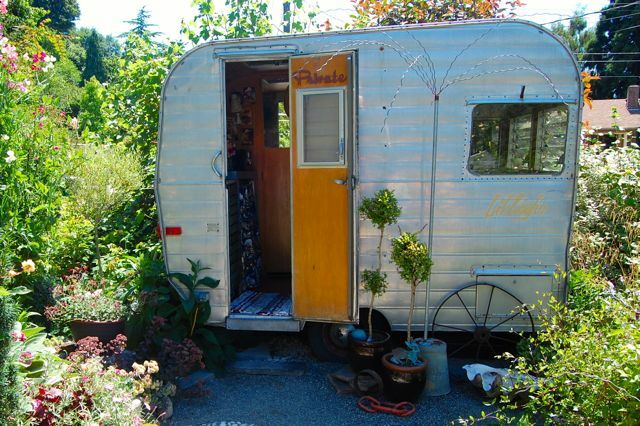 If it were up to my husband, we’d seek out a Boler, the great Canadian tiny trailer, which only needs a round door to qualify for Hobbit holidaymakers. And, you can take it with you. I almost defy you to find the shed in this picture. Of course, it’s the sliding-door structure on the right. So why does a shed have to be boxy, anyway? This one is like a closet, wide and shallow, making access to your stuff easier. Smart. To tell the truth, I don’t even remember what the outside of Kate Farley’s shed looked like. Inside is full of the artsy clutter that appeals to me. Mounting old dresser drawers on the wall for storage is an idea to steal. And how about that skylight? 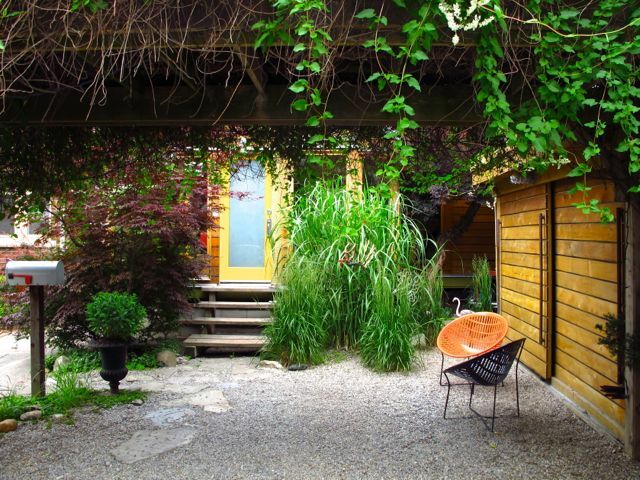 Be nice or leave: Board-and-batten siding, gingerbread and a formal entrance with a mirrored door spruce up the shed in this Toronto Beach garden on the Through the Garden Gate tour in 2010. See it in context here. The bench was a favourite, too. Our own shed was purchased as an $800 kit from Beaver Lumber about 20 years ago. My husband then added a playhouse on top that was a neighbourhood kid magnet for years, until they grew up, the raccoons moved in, and Mr. TG donned haz-mat gear to unmake it. Alas, there is no more Beaver Lumber, and no more $800 kits. But folks still do build their own. Hope you got some ideas here. Marie, My Portuguese is non-existent, but welcome to Toronto. 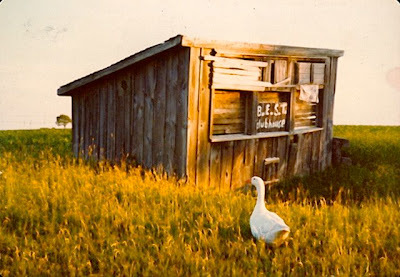 I remember some of those sheds. Very inspiring. But I was thrilled my husband, son and son-in-law spent a weekend building me a shed on the backside of the Tractor Shed. It is long and narrow and not terribly lovely, but very functional, and sited so that only the front is visible. It could use with some work. I'll have to put that on my list this year. Great to have willing family, isn't it! Enjoy your new shed. OMG those are so cute! I need a shed so bad. 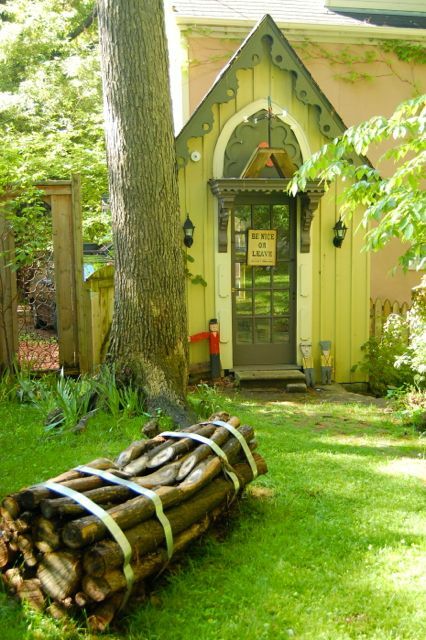 I have also seen outhouse sheds that are fabulous and functional, too. Fabulous and functional sounds like the ideal combination. Hope you get what you need. I love the chairs, too. I'll be doing a seating idea file sometime in the future, so stay tuned. 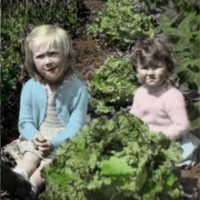 Helen on Want to win the Gardener’s Gratitude Journal?